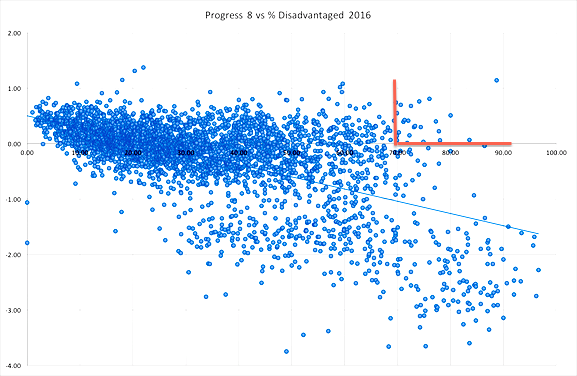 In a recent post Progress 8 – another attack on working-class schools we drew on Education Datalab research to show how this supposedly fair measure is weighted against schools serving poorer communities. This is because young people growing up in poverty tend to make less progress than others, and often become demoralised during secondary school. They become aware of youth unemployment in their area and see older siblings and friends disappointed in their ambitions. A graph produced by Tom Sherrington illustrates this. Progress 8 scores run from top to bottom, with the highest at the top. The zero line is shown in green. The proportion of students classified as disadvantaged (i.e. free school meals at any time in the last six years) shows from left to right, with the most disadvantaged on the right. It is very clear that more disadvantaged schools are highly likely to show negative Progress 8 (i.e. bottom right). Sherrington points out that very few schools with large numbers of disadvantaged pupils have positive Progress 8 scores. We have highlighted these with the red lines in this version in this version of the graph. The same blog post points to one contributory factor. A handful of students in a school who completely switch off can wipe out all the achievement gains of the majority. This is an enormous incentive for schools to get rid of these students by any means possible. He presents a hypothetical but realistic situation. The following chart shows a year group with 80 students, five of whom (shown here below the purple line) have completely disengaged and might even have failed to turn up to exams. Without these five, the school would have had a Progress 8 score of 0.07, i.e. just above average. Situations like this are likely to occur in more troubled areas. However hard they try, the teachers are likely to lose with some young people. Some of these young people may well be suffering from bereavement, mental health problems or traumatic family breakdown. Progress 8 increases pressure to exclude these students rather than care for them. Under the current accountability system, this school which has achieved a nationally average spread of progress against all the odds is penalised and likely to be targeted by Ofsted and Regional Schools Commissioners. 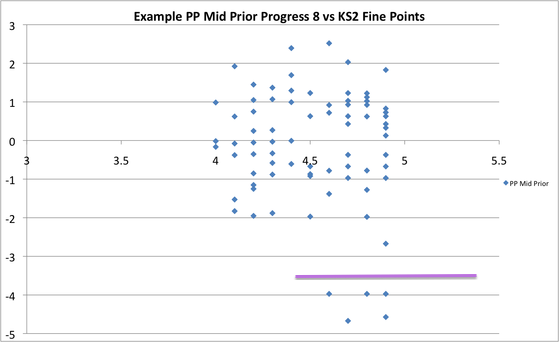 With thanks to Tom Sherrington for sharing his statistical analysis on his Teacherhead blog. This entry was posted in Accountability, Social Justice and tagged accountability pressures, disadvantage, Ofsted, poverty. Bookmark the permalink.